If you’re like most people, you probably think of hearing aids as unattractive, clunky devices. But modern hearing aids will truly surprise you with their versatility and appearance options. Since you should wear your hearing aids everyday, it’s vital to find a pair that you feel comfortable and confident wearing. The type of hearing aid you need will depend on the severity of your hearing loss. It’s important to talk to your doctor about which devices will work best for you before making any decisions. There are several varying styles of hearing aids, each of which look different in your ear. Smaller styles of hearing aids have the advantage of being nearly undetectable to others; however, they typically have fewer features and are harder to insert and adjust. Larger styles offer easy setting adjustments and placement, but they are noticeable to others, especially when worn by someone with short hair. Lyric—These hearing aids are some of the newest on the market. They are the first implantable, disposable, extended wear hearing aids that are completely invisible to others for patients. They are worn until their battery runs out, which typically takes about four months. When this occurs, you can remove the hearing aid using a small tool and throw it away before visiting your doctor for a new pair. Invisible In the Canal (IIC)—These devices are undetectable to those around you, but unlike Lyric devices, they must be removed nightly and during potentially damaging activities like showering. IIC hearing aids are cosmetically appealing, but they require patients to be able to insert and remove them and change their tiny batteries successfully. Completely In the Canal (CIC)—CIC devices are nearly invisible to others. Like IIC devices, though, they offer very limited features. 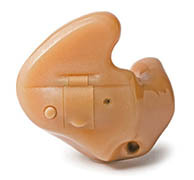 These hearing aids aren’t suitable for moderately severe to severe hearing impairments. They’re great, however, for those who want a subtle look and are able to change very small batteries easily. In The Canal (ITC)—These devices use a slightly larger battery than CIC or IIC models, making them easier to handle. They sit in the lower portion of the external ear and can be seen from the side, but they aren’t noticeable from the front. 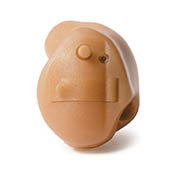 ITC, CIC and IIC models are all made specifically for your ear using custom earmolds. 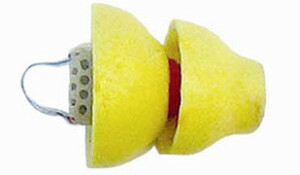 In The Ear (ITE)—These devices sit in the outer portion of the ear. They are more noticeable to others, but they are skin-toned and can easily be covered with longer hair. ITE hearing aids are beneficial because they are easy to adjust, offer many features and use larger, longer lasting batteries. 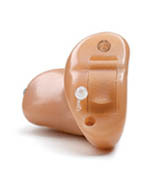 Receiver In The Ear (RITE)—RITE hearing aids are one of the hearing device options that contains two parts: a housing behind the ear containing the electronic components connected by a small, clear electrical wire to the speaker, which sits in the ear. 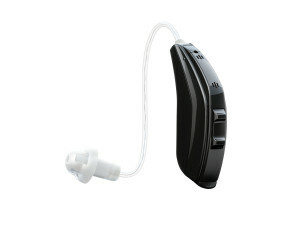 These hearing aids are barely detectable from the side or front, and they offer many features and easy adjustments. Behind The Ear (BTE)—BTE models house all electronics in the compartment that sits behind the ear. A small, clear acoustic tube then goes over the ear, delivering sound. This is a popular model for children as it is easy to use, but it can prove cosmetically unappealing for adults. If you’re concerned about hearing aid cosmetics, let the expert audiology staff at Hearing and Balance Center guide you in your treatment plans. We understand the importance of having confidence while wearing your hearing aids, and we will help you understand how you can hear and look great while wearing your new hearing devices.